EZCHEM stains reacts with the mineral content of the concrete surface for a deep penetrating permanent stain that produces colours ranging from rich and vibrant, to colours that gives an antique patina type finish; these colours are UV stable and will not fade in direct sunlight. EZCHEM floor stain is an inexpensive alternative to tile, slate, marble, etc. It is ideal for interior and exterior use in homes, commercial, and industrial areas. Cleanup and maintenance is as easy as a damp mop for most soils and spills. A thorough cleaning of the concrete surface is necessary. All dirt, grease, paint, sealer, or curing agents must be removed before applying EZCHEM floor stain. 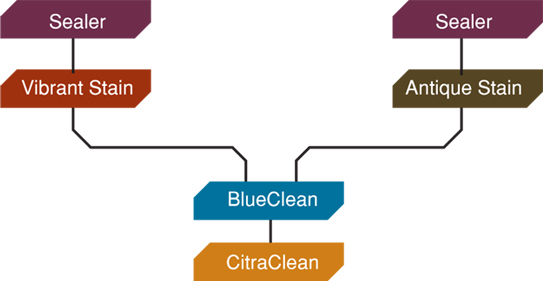 To prepare the surface for staining, use CitraClean and BlueClean and follow the directions as printed on the label. To test if the surface is ready for staining, pour a small amount of water on the concrete. If the water is absorbed into the concrete, then the surface is ready for stain. If the water beads up, then there is still some contaminant that needs to be removed. Always test the stain in an inconspicuous place, allowing it to stand for at least 4-6 hours. Protect all areas NOT to be stained with masking tape or plastic. Coverage is 150-250 square foot per liter depending on application technique and/or surface conditions. Apply BlueClean onto surface that has been pre-wetted with water. Allow to soak into the concrete for 5-8 minutes and rinse thoroughly with water. Apply EZCHEM floor stain with a sponge, plastic sprayer, or brush depending on the technique of your choice. A plastic sprayer is the preferred choice for large areas with one-colour applications. Do not walk on surfaces that are still wet or damp. Allow to dry thoroughly. Drying time will vary according to surface conditions and humidity. Depending on colour chosen, wash or damp-wipe residue on surface. If applying a second coating, be sure that stained area is dry and will not show footprints. Allow to dry completely before applying EZCHEM Sealer. EZCHEM Sealer is applied by a new or clean roller. Keep area away from human traffic for a period of 4 hours.